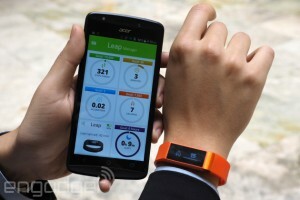 Acer presented at Computex its new devices, the Liquid Jade and the Liquid Leap. The Liquid Jade is a 5-inch smartphone that will be sold along with the Liquid Leap, a smart bracelet that complements the phone. 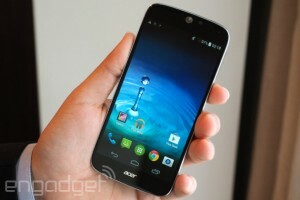 The Acer Liquid Jade has a 5-inch display with 720 pixels, Gorilla Glass 3 protected screen and Zero Air Gap technology. It features a quad-core MediaTeck processor and two possibilities memories, with 8 or 16 GB, both expandable via microSD card. The company claims that this is an extremely compact phone with a thickness that reaches only 6.8 mm at its thickest point, which is right where we can found the rear camera, which projects slightly from the back of the device. The extra volume of the camera is due to the 13 MP sensor with f/1.8 aperture which allows a speed of focus of 0.3 seconds. 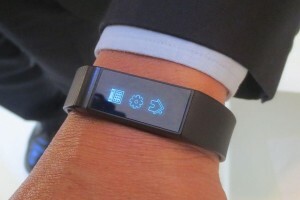 The Liquid Jade comes with another device, halfway between a smart watch and a smart bracelet. The Liquid Leap has a touch screen and tries to put together the advantages of a basic smart watch with a bracelet designed to monitor our physical activity. The Leap Liquid has a rubber strap and it is designed to be comfortable on the daily use. It has a 1-inch screen and has no physical buttons, which allows it to be very thin. It has the most common applications of all physical activity monitors, such as calculating the steps taken, the distance traveled, the calories burned, and even the sleeping cycles. Furthermore, we can use it to receive notifications from our phone, see incoming calls, and control the music player of the smartphone. It is available in several colors: white, black, aqua, pink and orange. The battery is optimized to last up to 7 days of moderate use and is water resistant. It currently supports only the Liquid Jade, but the company plans to extend the support to more Android devices with Bluetooth 4.0. The Liquid Jade will be released the third quarter of 2014 and is expected to have a very affordable price, probably around 300 €. In principle, the Liquid Leap will be sold together with the phone, but Acer also offers the possibility to buy it alone. However, as the Leap does not have compatibility with any Android device, we can’t do many things without buying the Liquid Jade, as it is currently the only device that can connect with. We will know more details as the release date approaches, and probably the compatibility of the Liquid Leap with other Android devices is not far.